VR SuperGun is a custom hardware and software solution that allows players to connect with original arcade platforms over a network connection, while reconstituting the material form of the arcade cabinet in digital space. 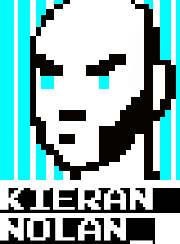 It extends the format of the standard SuperGun, a device that contains the wiring of an arcade cabinet in consolised form. An exploded view of the virtual arcade cabinet with Capcom’s Ghosts ‘N Goblins (1985) playable in a web browser, streaming direct from a JAMMA arcade board. 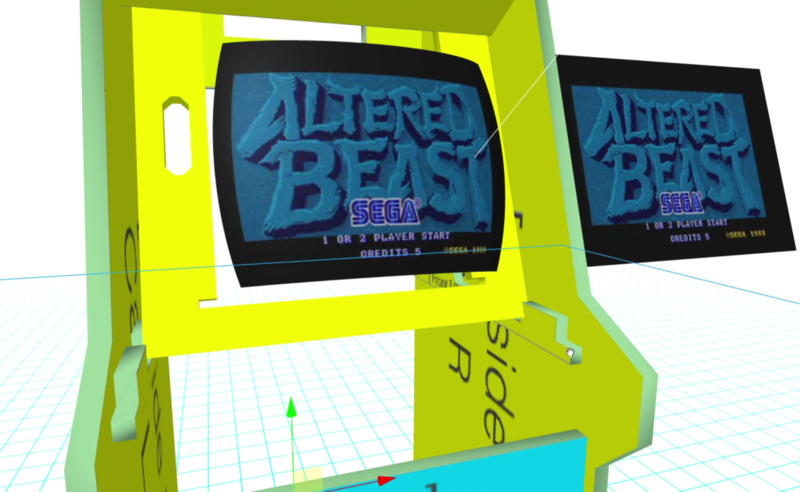 A rotating view of VR SuperGun‘s virtual CRT monitor. The system can also can also be modified to fit inside a full size arcade game cabinet, with a pass through connector leaving normal player access to the game coin-op unimpeded. VR SuperGun augments the arcade system’s visual display, rerouting the direct feed from the arcade PCB’s visual and audio outputs to the virtual display of a virtual reality arcade cabinet. This virtual arcade shell visually recreates the presence of a full size arcade cabinet in interactive 3D space, including its internal design and electronics. In addition to playing the game presented, the user can inspect the cabinet and it’s surroundings, while accessing the technical specifications and history of the game and cabinet. The network aspect of the VR SuperGun prototype, JAMMAnode, extends access to the attached game board to remote participants, facilitating long-distance cooperative play. As arcade games move from public space to private collections and museum exhibits, this hands off access allows player access while causing no damage to the arcade cabinet’s physical enclosure. A supplementary video feed allows the remote user to see the attached board and it’s local environment, strengthening the connection between the player and the original host hardware. As an experimental prototype, VR SuperGun attempts to bridge the gap in-between the authenticity and tangibility of experiencing arcade gameplay through original hardware and in situated space around the arcade cabinet, netplay, and the gameplay spectatorship afforded through livestreaming. In the context of game art and media art it uses the material of the JAMMA hardware interface to explore the boundaries of interfacing with the complete arcade machine through remote digital means, providing a meditation on the physicality of hardware both in its form and situated environment, alongside the representational experience of these aspects through software. 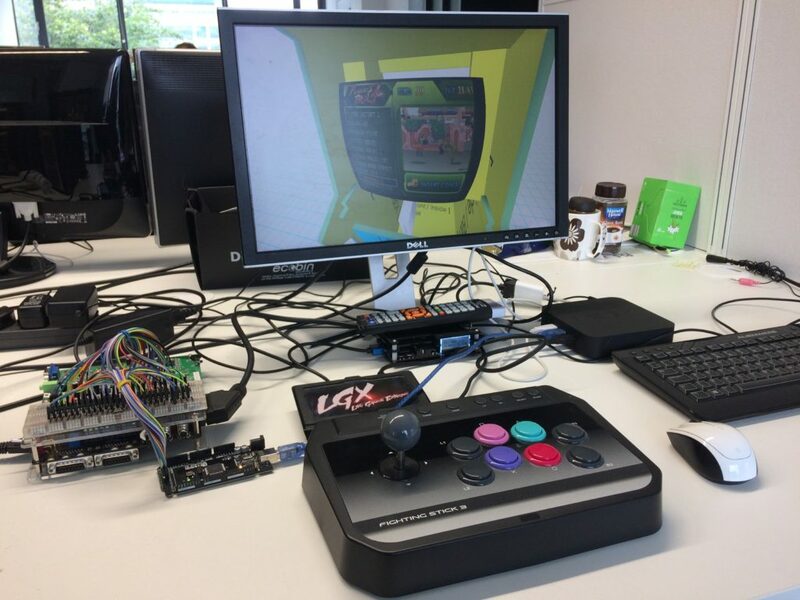 The VR Arcade SuperGun prototype set up in desktop mode using a flat display. 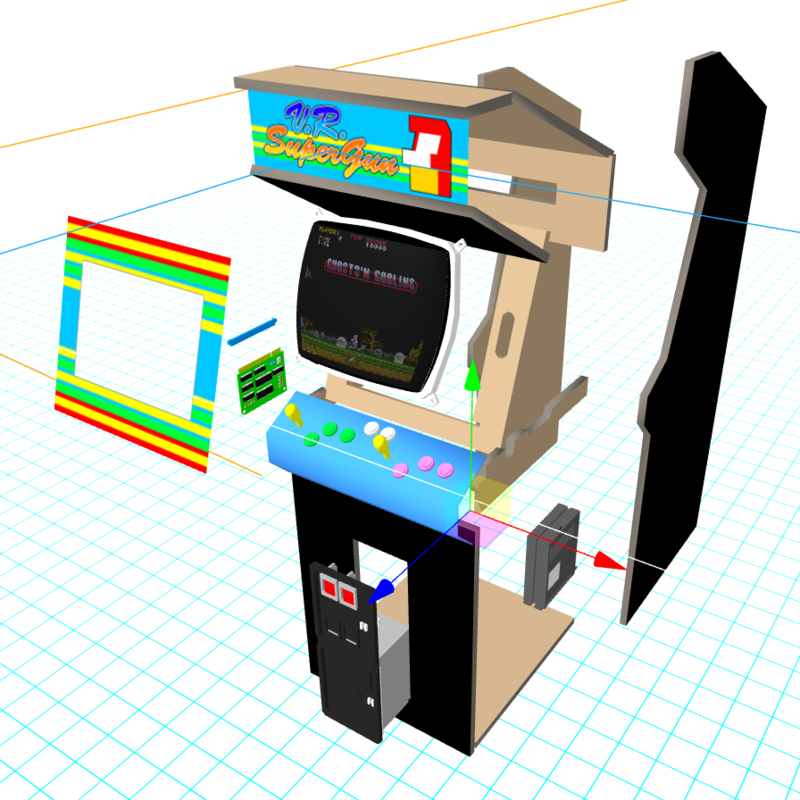 This prototype uses A-Frame WebVR as a delivery platform, bringing network connectivity to the JAMMA arcade standard. 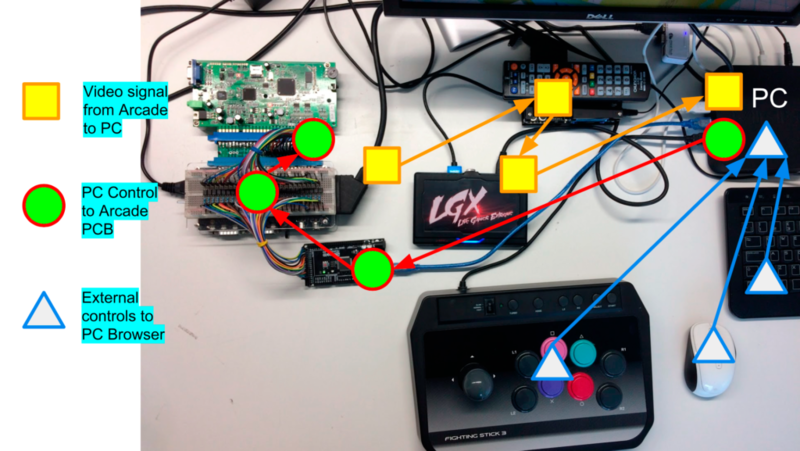 Live video stream from the connected JAMMA game PCB is presented as the screen texture on a 3d representation of an arcade machine using, thus reconstituting the physical form of the coin-operated cabinet in the digital space of the web browser. VR SuperGun’s graphics are delivered in a low polygon style fitting a mid 1990s arcade vector graphics aesthetic. By using an A-Frame WebVR enabled interface VR SuperGun is accessible from basic desktop and mobile browsers as flat 3D, and also through WebVR compatible Virtual Reality, Augmented Reality, and Mixed Reality headsets. As an experimental prototype, the VR SuperGun attempts to bridge the gap in-between the authenticity and tangibility of experiencing arcade gameplay through original arcade cabinet hardware, and the ease and convenience of network enabled arcade emulation. An early version of the VR SuperGun prototype, displaying a live feed from Altered Beast (Sega, 1988) streamed to the HTML Canvas. The video texture is mapped to a modified sphere on the left, and to a flat plane on the right. The VR SuperGun hardware setup (minus display). Arduino to JAMMA circuit detail.